When the Social Innovation Forum selected Mill City Grows for the 2014 Social Innovator cohort, the small, early stage organization located in Lowell, Massachusetts, had passionate leaders and a promising model. Mill City Grows used urban farms and community gardens to increase access to healthy and affordable foods in neighborhoods that lacked full-service grocery stores and healthy food options. 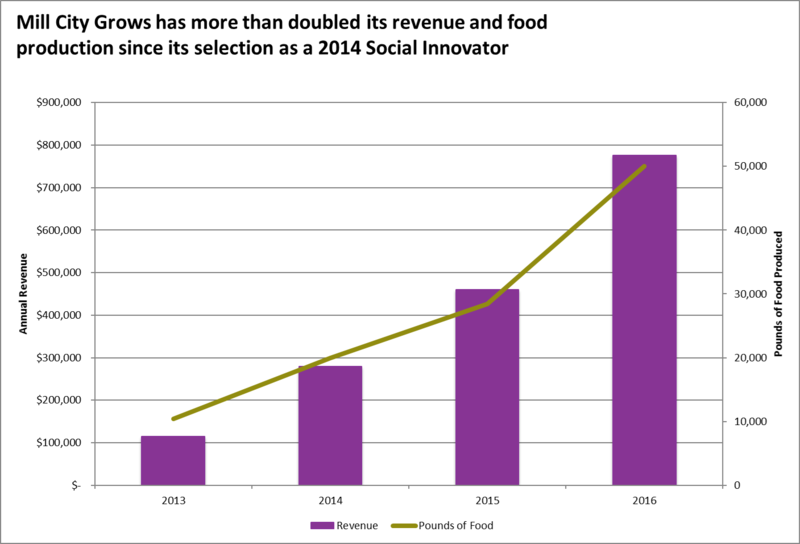 At the time, co-founders Lydia Sisson and Francey Slater had set an ambitious goal to launch a Mobile Market and increase the organization’s annual food production from 12,000 to 50,000 pounds by 2016. However, the organization was struggling to attract funders, gain visibility, and demonstrate its value to an audience beyond the Lowell community. It needed additional capacity to expand its reach and hire and train new staff. Seeing their drive and potential, SIF and its track partner, the Schrafft Charitable Trust, selected Mill City Grows to participate in the 2014 Social Innovator Accelerator cohort. In the Accelerator, Mill City Grows worked with its SIF consultant to create a multi-year growth plan and develop consistent marketing materials that highlighted the organization’s impact. SIF’s consulting process helped the co-leaders to develop organizational performance metrics as well as to broaden their networks in Boston. Sisson and Slater had an opportunity to learn from a cohort of other nonprofit executive directors. They also received support from a host of skilled volunteers and in-kind partners, which helped shape Mill City Grows’ programs and prepare Sisson to deliver a compelling pitch to a full room of local business and philanthropic leaders at the 2014 May Social Innovator Showcase. SIF really helped us turn our passions and excitement into reality. We got to connect with a lot of people and built a trajectory for growth and sustainability. The SIF experience was a turning point for the organization. This year, Sisson, Slater, and their team are making a new strategic plan, leveraging the work they did in the Accelerator and setting a course for an even greater impact. “SIF really helped us turn our passions and excitement into reality. We got to connect with a lot of people and built a trajectory for growth and sustainability,” said Sisson. Today, Mill City Grows is one of the leaders in improving physical health, economic independence, and environmental sustainability in Lowell. The organization offers a range of programs and services, including community gardens, urban farms, school garden programs, educational programs, and a mobile market. Mill City Grows just celebrated its sixth anniversary and hosted its fifth annual “Farm to Cocktail Party,” which attracted more than 350 guests and raised $113,000 to support its mission and ongoing work to make a lasting positive impact on Lowell and its residents.